Bayit Yehudi chairman: The campaign is behind us, the negotiations are behind us, and we'll all stand behind Prime Minister Netanyahu. The members of the Bayit Yehudi Knesset faction met Sunday, for their first full meeting as members of Prime Minister Binyamin Netanyahu's government. 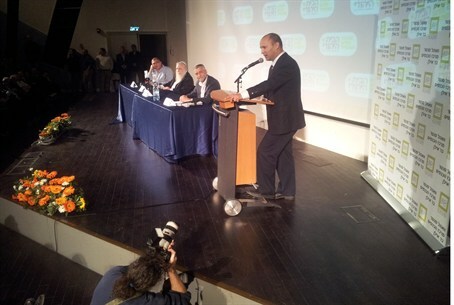 During the meeting party chairman Naftali Bennett finalized the appointments party members will receive in the government. Bennett emphasized during the meeting that now that the long coalition negotiations are over, his party will be 100% behind Netanyahu. Under the coalition agreements, the Bayit Yehudi will receive the following roles: Bennett will be Economics and Trade Minister, and will also be responsible for the Religious Affairs Ministry, with the deputy minister, Rabbi Eli Ben-Dahan, expected to handle the Ministry's day to day affairs. Bennett will also hold the Diaspora Affairs Ministry. MK Uri Ariel, number two on the Bayit Yehudi list, will be Housing Minister, and have Ministry responsibility for the Israel Lands Administration. MK Uri Orbach will be Minister for Elderly Affairs. MK Avi Wortzman will be appointed as Deputy Minister of Education. MK Nissan Slomiansky will head the Knesset’s Finance Committee, while MK Ayelet Shaked will be the faction’s chairwoman.